The investigation into Russia’s alleged collusion with the Trump campaign continues. With the way the media has been talking about it ever since Hillary lost, you’d think they’d have something by now in the way of evidence. But they don’t. 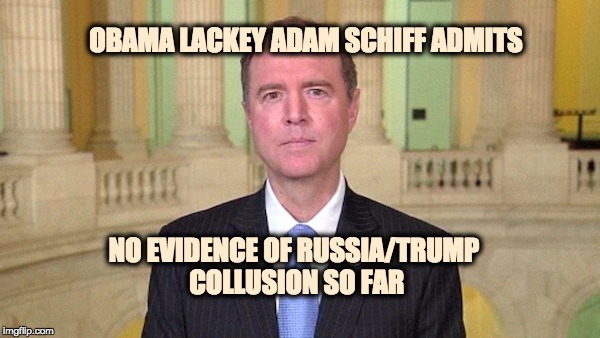 Even Adam Schiff (D-CA), Obama lackey and the ranking Democrat on the House Intelligence Committee, is still acknowledging that he doesn’t have any evidence to support the Russia-Trump narrative. He still believes that there is evidence; he just hasn’t seen it yet. At the same time, he thinks that it’s definitely premature to claim that there is no proof. CUOMO: No proof — no proof Peter King says. I have seen no proof of collusion between the Trump campaign and Russia. Carter Page says the allegations are laughable. What do you say? SCHIFF: Well, Carter Page is a person of interest to the community and probably likely to come before the committee, so I don’t want to comment on anything he’s had to say in particular. But I do think we need to get to the bottom of these allegations of collusion or coordination. I have to disagree with my colleague in terms of whether there is any evidence of collusion. I believe that there is. But nonetheless, this is something we need to investigate. I think there was a reason why the FBI began its investigation and why it continues that investigation. I don’t think it is something the FBI does without any basis. But that’s about as much as I can say without going into particulars. I will say this, I think it would be deeply irresponsible of us not to follow the facts where they led, to do it objectively and not predetermine a conclusion. But there’s certainly as we have seen from many of the public reports, ample reason to do this investigation. Usually with things like these, there’s probable cause that serves as a basis for an investigation. They can’t even articulate probable cause. There was a FISA warrant granted to monitor early Trump aide Carter Page. We still don’t know much about that as far as the details that led a judge to grant the surveillance warrant. What if there ends up being no evidence after this investigation? CUOMO: Concern politically if there winds up being no real proof that is actionable on a prosecution basis about the campaign or the administration and Russian operatives that will be seen as a failure and a ruse? SCHIFF: Well, it shouldn’t be seen as a failure if we do our jobs and we follow the facts wherever they lead and we reach a unified conclusion. We shouldn’t go into this with the object we want to score this political point or that political point or we want to come up ultimately with a certain conclusion. We’ll be doing our job if we thoroughly investigate this and if we can reach a sound determination about what happened, what the Russians did, the different levers the Russians pulled. We know the Russians used a variety of techniques to interfere with elections in Europe. They used some here. And we want to find out everything the Russians did. I think that is what we ought to do responsibly. I would say also, though, I think what would give the public the greatest confidence in addition to what we’re doing is if we had a truly independent commission that was well resourced and could be completely removed from any political consideration. I think that will be a supplement to what we do and not instead of what we’re doing.